Asian cuisine is known for its stir-fry dishes, and Thai food is no exception. These stir-fried noodles have a flavorful stir-fry sauce which can be made vegetarian or vegan by substituting some of the ingredients. You can also get creative and add a bit of protein such as chicken, tofu, or shrimp (or a combination), or swap out some of the vegetables for favorites. Although most Thai noodle dishes are made with rice noodles, there are also various Chinese-inspired Thai noodle dishes made with wheat or egg noodles, as in this recipe. But no matter what type of noodle you use, this dish is sure to satisfy the taste buds—stir-fries in Thailand are never bland or lacking in flavor! Boil noodles in lightly salted water until al dente, veering on the side of undercooked (you will be stir-frying them later so avoid overcooking them now). Drain and rinse with cold water to prevent sticking. Set aside. Place all stir-fry sauce ingredients together in a cup, stirring well to dissolve the sugar. Set aside. Heat a wok or large frying pan over medium-high heat. Add oil and swirl around, then stir-fry the garlic, ginger, and shallot for 1 minute. Add the carrots plus 1 to 2 tablespoons of the stir-fry sauce you made earlier—enough to keep ingredients frying nicely. Stir-fry 2 minutes, until carrots soften slightly. Add the mushrooms, broccoli, and red pepper, plus 3 to 4 more tablespoons of the stir-fry sauce. Continue stir-frying until mushrooms and red pepper soften and broccoli turns bright green but is still crisp, 3 to 4 minutes. Add the noodles plus the remaining stir-fry sauce. Using 2 utensils, lift and turn the noodles in the pan to combine with the vegetables. Stir-fry in this way 3 to 5 more minutes, or until you are happy with the softness and texture of the noodles. During the last 1 minute of cooking time, fold in the bean sprouts. Taste-test the noodles, adding up to 1 more tablespoon fish sauce or soy sauce if not salty or flavorful enough. If too salty for your taste or too sweet, add 1/2 to 1 tablespoon more lime juice. If too sour, add a little more sugar. More chili can be added if you prefer it spicier. Serve immediately in bowls or plates, topped with a sprinkling of fresh coriander or basil. More fresh bean sprouts can also be added as a garnish. 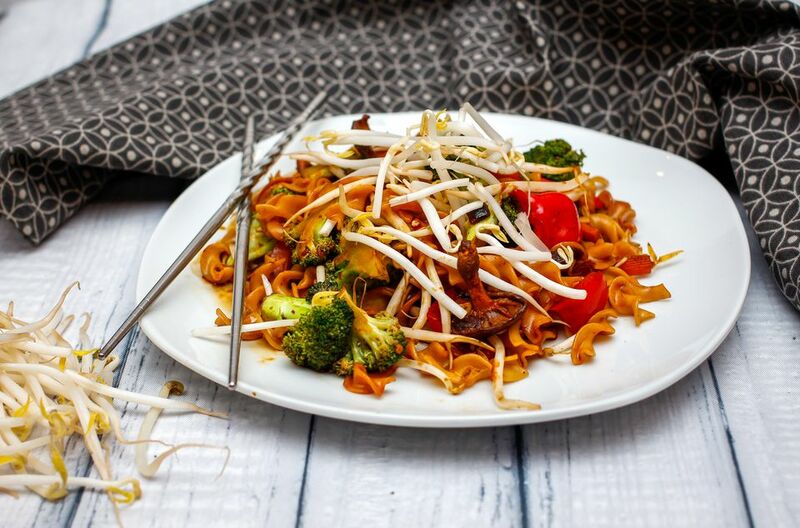 Stir-frying may be a quick and easy way to get a delicious and healthy meal on the table, but if a few things aren't done right, you may end up with an unevenly cooked, burnt, or gloppy mess. First, make sure you do not overcook the noodles—noodles past the point of al dente will not stir-fry well and won't look appealing. And if you are using fresh noodles, they need less than a minute to cook. It is also important that you have all of your ingredients ready before you begin stir-frying, including the vegetables. Stir-frying is a quick process, so if you are delaying between each step to chop or slice, the dish will not turn out as it should. This recipe is easy to make vegetarian or vegan by just swapping out a couple of the sauce ingredients that contain seafood. Instead of using 1 tablespoon fish sauce, add 1 additional tablespoon soy sauce to the stir-fry sauce. And you can purchase vegetarian oyster sauce and use 3 tablespoons, or substitute with 3 tablespoons vegetarian stir-fry sauce.